Art for therapy has always been very important in my life. When I was a teenager and a young adult, I used art to help me get through tough times. My art was how I expressed the difficulties I was going through. Recently I have seen more and more people promoting the use of art for healing purposes. This video on CNN shows how art is used to enrich the lives of people with Alzheimer. A couple of years ago I drew a quick sketch that I stuck away in a sketch book and forgot about. A few weeks ago I was going through my old sketches and it caught my eye. As I was looking at it, a finished piece started to form in my mind. 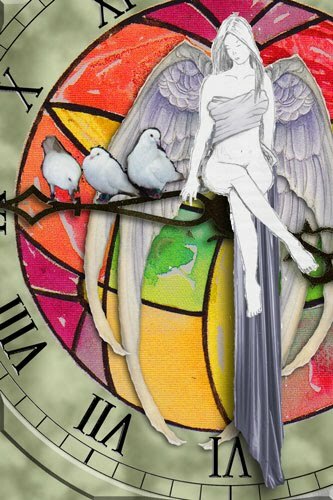 I imagined a faerie sitting on a the hands of a clock with a couple of birds. The sketch itself had some problems and needed some work, so I spent a few minutes fixing those issues and went looking for reference material for the final piece. I can't remember life as an artist before the internet and Photoshop. I must have blocked it out because life is so much easier now. What used to take hours at the library searching for reference material and possibly days drawing and redrawing to come up with the perfect design can now be done in a very short time. I sat at my trusty laptop and searched for three things: a clock face, doves and wings. I found three images that I liked and saved them. 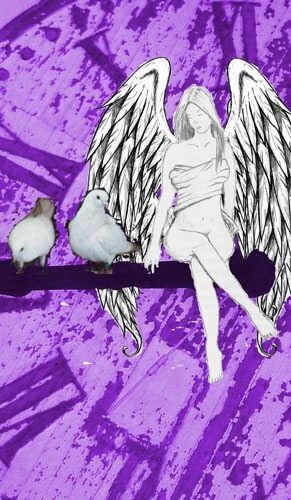 I separated the doves from an image that contained several birds and started putting the image together. The composition of a piece of artwork is as important as the composition of a great piece of music. All of the elements must work with each other and they must fit into a framework that is pleasing to the viewer. Centuries of studying great artists have lead to the discovery of the use of the Golden Mean. The Golden Mean, or Golden Ratio, is a geometrical concept derived from the mathematical Pi. There are tons of websites that describe how it all works on a mathematical level involving the Fibonacci Sequence. But for our purposes on this site, I am simply going to show you what it looks like when drawn visually. So what does this have to do with artistic composition? For some reason that has yet to be accurately explained, the human brain absolutely loves this visual design. The eye follows the spiral line to it's natural conclusion and everyone is happy. Have you ever noticed that vacation snap shots tend to be boring, but professional images of the same locations can be stunning? We live in a very ordered society. Everything has to be compartmentalized, labeled and put in its place. So when we take a snap shot we try to do the same thing. We put our main subject directly in the center and the horizon line exactly halfway down. The professional photographer does not do that. They almost always have the main subject off center and the horizon line is never in the middle. The closer the photographer composes his shot to the Golden Mean, the more appealing his final image will be. The same goes for art. It doesn't matter what direction the spiral is going, but the elements in your final design should always follow its lead. With all of this in mind I started putting my elements together in Photoshop for a first draft of the design. I liked this ok, but it did not have the dynamic pop that I was looking for. It did not express the emotion that I was wanting to present and the faerie, as well as the doves, got lost in the mass of purple I used for the clock face. It did not looks so much like constructed work of art as it did a really weird acid trip. I also noticed that I put the clock hand right across the middle. Essentially putting the horizon line exactly where I was not supposed to put the horizon line. Finally, the image was very top heavy. The bottom of the image was just empty space. The first thing I decided to do was to create my own clock face instead of relying on photo reference from the internet. This was simple enough to do in Photoshop. I'm not going to go into detail here about how to use Photoshop, there are lots of tutorial based web sites that will give you all of the information you need to know. Once I got the clock face created I decided that instead of making the whole thing one solid color, I would turn the clock face itself into a stained glass window. I remembered one of my art books having a tutorial on how to create stained glass using watercolor. So, I scanned an image from that book as an additional element to my composition. I knew I was not going to use this exact stained glass design for my final image, but this would at least allow me to do a mock-up to use as a guide for my finished piece. I found a different reference for the wings. I did a LOT of distorting a duplicating in Photoshop to get the wings to look exactly the way I wanted them. Then I had to deal with the empty space at the bottom. The faerie obviously had a piece of fabric wrapped around her body, so I decided to continue that fabric into a long drape that she was sitting on. A quick web search resulted in a window drape that worked nicely with a bit of tweaking and distortion. So here is my final draft. In future postings I will talk about the processes of designing the stained glass, transferring the design and how to bring each of the elements to life. Pencil Portrait Lessons is going color! I am currently working on a new book called The Real World of Colored Pencil. As I create the tutorials for that book, I will be presenting them here. Those that read this site will have access to them long before the book is ever released. This image is our final goal. I decided to create this tutorial because it demonstrates a very important issue when dealing with color: The importance of seeing the colors that actually exist. At first you might think that all you need to represent the petals is yellow and maybe red. The background looks like it might be just a couple of colors of green. The reality is I used 12 different colors to create this final image. This is the original photograph that we will be working from. Before you start, many decisions must be made. My first decision was realism. How realistic do I want to make my final piece. I decided to go with a more artistic look as apposed to seeking photo-realism. I wanted a soft, but powerful image. The next decision was cropping. I wanted the flower to stand out and make a strong statement. 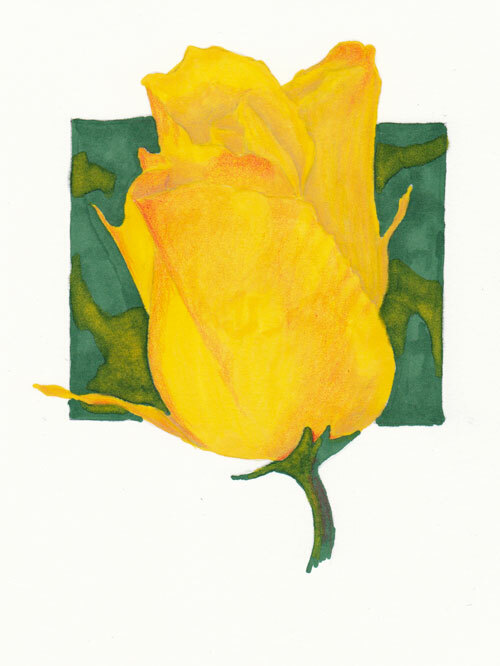 So, I made the background considerably smaller than the flower itself. Next decision was tools. Paper was easy to decide on. I wanted bright vivid colors so the paper needed to be pure white. I also wanted a smooth finish without texture but enough of a tooth to get good solid pigment coverage. I went with Strathmore Smooth Bristle acid free 100 lb white. 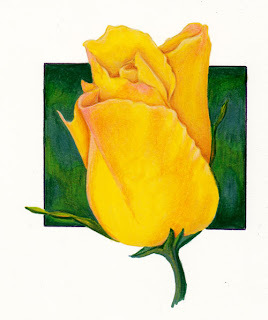 I created the initial sketch with a Derwent 2B drawing pencil. The sketch was a lot lighter than what you see here, but it was necessary to enhance it so you could see what I have done. There are many ways that you can do an underpainting. You can use watercolor, watercolor pencil, markers or any number of media. I decided to use the Prismacolor Premier Art Markers. An underpainting is important because colored pencils are difficult to completely cover an area. 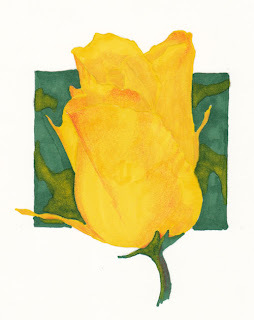 In most cases, little bits of the paper will show through unless you really overdo the pigment. I used to do that and suffered from a problem called Wax Bloom. I put so much wax on the paper that over time it all rose to the surface and clouded the original image making it dull and lackluster. 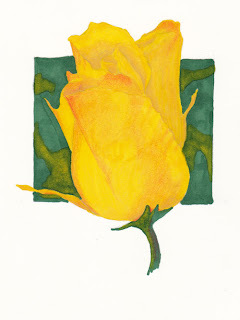 Using the Canary Yellow and the Dark Green art markers I quickly laid in the base colors for the image. I was not too concerned at the point on making it look smooth since I was going to cover the whole thing with pencil anyway. I want the background to be dynamic. 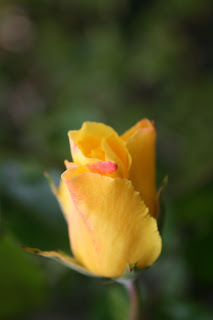 I want it to give the illusion that there is more vegetation behind the rose, but the detail is out of focus. One of the fantastic properties of the Prismacolor art markers is you can blend a light color right on top of a darker color without damaging the lighter marker. In this case, I used the technique to put in some yellow/green patches. Later, this will allow for some very interesting colored pencil effects. Colored pencils are transparent. Because of this it is beneficial to work with darker colors first. Lighter colors can be used over the darker ones making blending fairly simple. Here I used the red on the tips of some of the petals and used light circular strokes to start laying in some of the shadow areas. This is the beginning of defining the depth or the image. Also note the red that was added to the stem. The key to good colored pencil is working in layers. This is starting the first layer. Don't forget to pay close attention to your original reference photo. Everything you need to know for you work is in the photo. Study it very carefully and refer to it constantly. The orange is used to further enhance the shadowed areas and to blend some of the red that was laid down in the last step. A lot of artist will reach for black the instant they want to darken something. It is better to use a value of gray. I chose warm gray for this because the yellows and reds are warm colors. I chose 20% because I did not want to go extremely dark, I just wanted to desaturate some areas giving the impression of depth. Remember, art is nothing more than an illusion. 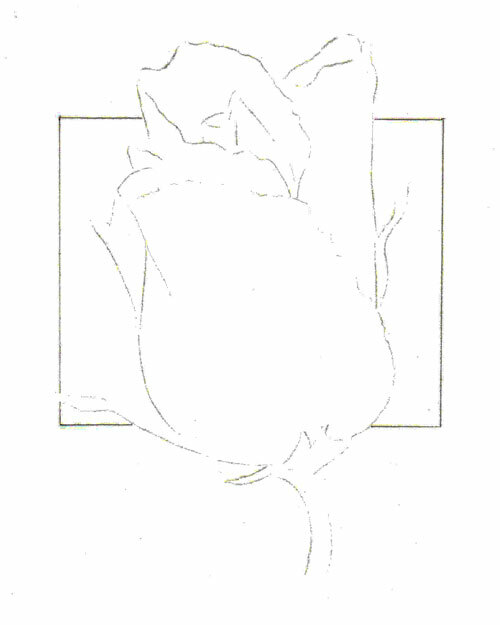 We want the brain to look at some of the petals and think they are actually behind the others, when in reality it is nothing more than a two dimensional image. Desaturating color is a excellent way to establish this illusion. The bright Canary Yellow is used over all of the flower. It is also used to blend all of the colors you have laid down so far, resulting in a much smoother transition from color to color. Don't forget to keep in mind that all you are doing is reproducing light and shadow. Look closely at the original photo and notice where they light reflects the brightest. Those areas appear to be white. 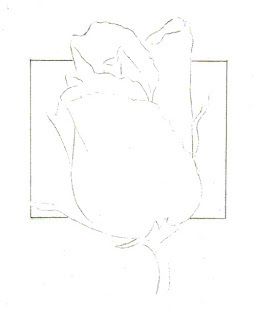 The next step in creating this illusion is to add white colored pencil to those area. The next layer of Mineral Orange is used to further deepen the shadowed areas. The final layer of yellow is applied pretty heavy. 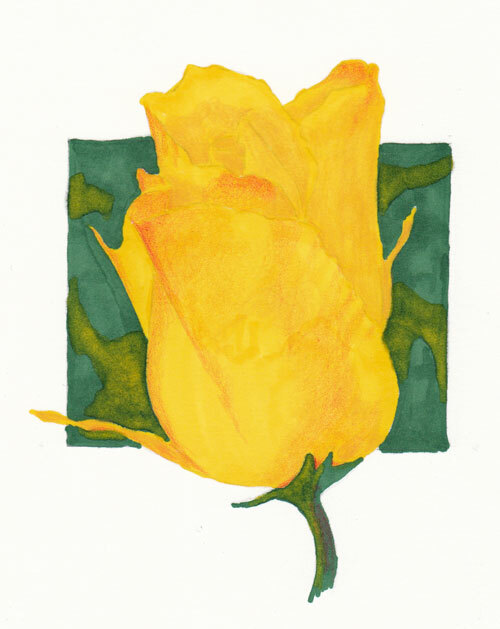 Use the yellow as a burnishing layer to blend and smooth out the rest of the colors. At this point I decided that there was not enough contrast between the lighter and darker areas. I considered using a darker gray, but I was not looking to mute the color. I was looking to make the color more dramatic. So, I used the Sienna Brown in the darkest areas. That darker color against the white highlights really added dimension and color to the project. Finally we get to start on the background. 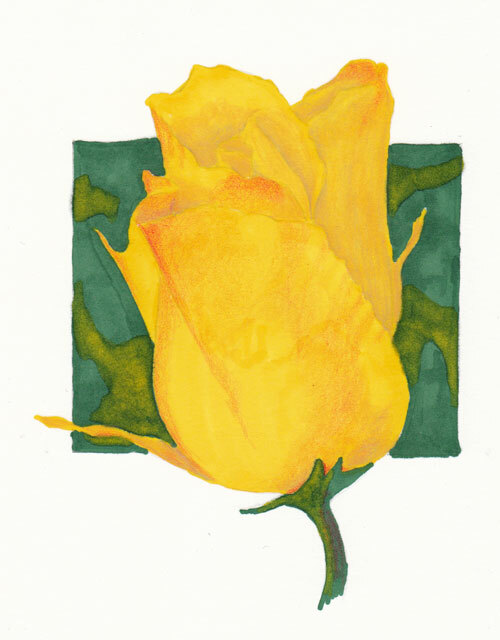 Put a thin layer of Dark Green over the entire background. You don't want to cover everything up. Make sure the yellow areas can be clearly seen through the layer of green. Also notice that the leaves of the rose now get a layer of green to differentiate them from the flower itself. Pay close attention to the stem. 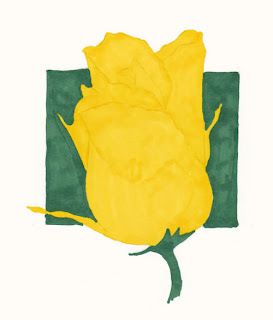 Using the Dark Green, lay in the shadow areas of the stem. Spring Green is used to fill out the lighter green areas of the background as well and lay in the lighter areas of the stem. If you looked closely at the original photograph you noticed that there was a lot of light blue in the bacgkround as well as the stem of the flower. I chose Periwinkle for the blue because it blends very well with the greens that we just finished using. Final layer for the Dark Green. Use it to deepen the contrast between the lighter green and the blue. More contrast means more drama. If we really want to make this image pop, we should attempt to make it dramatic. The only real purpose for the Black Grape was to outline the border. The dark tones in this color complement the blues and reds in the rest of the image. It may be subtle, but the brain will pick up on it. Using a solid black would not have been near as pleasant. I used a short plastic ruler as a straight edge to make sure the lines were as perfect as I could get them. Then I used the Dark Green to fill in some areas that remained white between the border and the background. That wraps it up for this tutorial. If you have any questions, feel free to ask in the comments. Thank you so much for joining me in this project. I look forward to sharing more projects and discussions soon. This image was created by an incredible artist by the name of David Deen. I have the true honor of calling him my friend. He created this image as a book cover for War of the Outcast written by another good friend: Michales Warwick Joy. I met David at the first Science Fiction Fantasy convention that I ever attended. His work was absolutely stunning and I made it a goal to get to know him that weekend. I am so happy that I did. Like any other aspiring artist, I was full of questions about techniques and how to possibly make a living with art. When I asked him how he makes his colored pencil work so realistic, he gave me four bits of advice. I took his advice and immediately following the convention I purchased a good set of PrismaColor pencils and created Monarch; the first of my butterfly series. In the years since, David has gone on to be one of the most popular artists in the midwest convention circuit, he has created many book covers and most recently worked on a popular young adult series called Groovy Tubes. Be sure to check out Groovy Tubes: Mythical Beasts at Amazon. David has been a true inspiration to me and is the primary reason why I became an artist instead of just using art as a hobby. When I met him, my work was amateur at best, but he saw potential and treated me as an equal artist. Each of us needs a David in our lives. Someone that encourages us and believes in our dreams. Someone that not only sees us for who we are but sees us for who we will be. I encourage you to seek out local artists, go to art shows and talk to them, comment on their blogs and get to know them. What you will learn from them can be amazing and take your life in wonderful directions. I owe a debt of gratitude to David and I highly recommend you check out his web site - www.daviddeen.com. If you are interested in learning his artistic techniques, check out his newsletter Imprint. He has two series on his site, one detailing an incredible work of art using colored pencil and the other using acrylics. If you have your own version of David Deen, your own artistic inspiration, please let us know in the comments. We love to promote other artists and to hear their success stories. There are many uses for art, but one of the most important uses is almost always overlooked. We use art for decoration and visual pleasure. We use it as a way of sharing with family and friends. But art is far more than that. Art is a method of healing. Everything from depression to the effects of cancer treatments can be treated using art as a form of therapy. This short film introduces several people that use art to enhance their healing process every day.